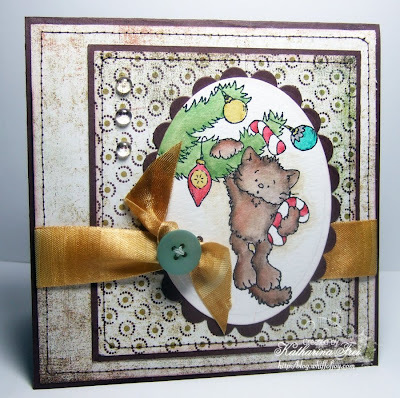 I used one of my favourite High Hopes christmas stamps (Callie Christmas Kitty) and coloured it with water soluble pens, Twinkling H2Os and glitter pens from Spica. Papers are from Basic Grey and the ribbon from the Raspberry Ribbon december kit. I hope you'll have the time to enjoy the beauty of christmas tomorrow and don't have too much stress :) If you might be too busy to stop by tmorrow, I already want to wish you and your families a blessed christmas eve and lots of joy and fun together. Ich habe einen meiner liebsten High Hopes Weihnachtstempel verwendet (Callie Christmas Kitty). Coloriert habe ich mit meiner liebsten Technik ;) Aquarellstifte, Twinkling H2Os und Glitzer Stifte. Das papier ist von Basic Grey und das Band von dem Raspberry Ribbons Dezember kit. Ich hoffe ihr seit morgen nicht allzu sehr im Stress und könnt die Magie des Weihnachtstages genießen. Wenn ihr keine Zeit haben solltet bei mir hereinzuschauen, wünsche ich euch schon jetzt ein gesegnetes Weihnachtsfest und viel Freude mit euren Familien!! für Dich und Deiner Familie schöne Feiertage und einen lieben Weihnachtsmann der alle Wünsche erfüllt. eine schöbe karte!! süßes motiv. ich wünsche dir und deiner familie ein schönes weihnachtsfest!! Ich bin auch noch dabei die letzten Weihnachtskarten fertig zu basteln und an die 30 Stück habe ich bestimmt gemacht und verschickt. Deine Karte ist einfach voll Süüüüüüß geworden. Tja kleine neugierige Katzen und Kinder hängen öfter zwischen dem Weihnachtsbaum und gucken ob es wohl was zu naschen gibt *lach*. Ich kenne das von meinen beiden Rackern *grins*. Ich wünsche Dir und Deinen lieben ein besinnliches Weihnachtsfest und einen fleißigen Weihnachtsmann. What a cutie!... Lovely card!!.. What a cute stamp, and a beautiful card - as always! I'm the same...I was a bit behind this year (don't know why!) but i got some gorgeous new stamps that need played with yet!! So i'll be ahead of the game next year!! I love this little cat image....love your card! die Karte ist ja witzig. Der Stress hält sich in Grenzen, aber mal sehen was noch so für Katastrophen passieren bis morgen, grins. A very Merry Christmas to all your family. 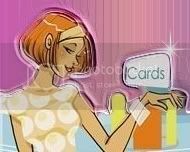 I look forward to a wonderful year with all your beautiful cards. That is a wonderful image! I have felt that way more than once, and just love his cute little expression!!! ich wünsche dir und deiner Familie ein frohes Weihnachtsfest und alles Gute für´s neue Jahr 2009! Katharina that is a gorgeous card! It's so adorable! And yes, it is sad that we have to put away all of our fun Christmas stamps (however, my stamp corner will love it, as my holiday assortment of supplies is consuming my space...hee hee)! Have a joyous holiday season! I love this card. I could have taken the same picture myself earlier as our cat hung on the Christmas tree! I love your blog. I just love this image!! What an absolutely fabulous card Katharina! Wishing you a very Merry Christmas and all the best for 2009!! Ach ist die Karte knuffig, Katharina! Lovely card. Merry Christmas and Happy New Year to you and yours. Oh, what an adorable stamp!...and what a lovely job you did with it!!!! My wish for you is for you and your family to have a lovely (and safe) Christmas. It's an adorable card Katharina! I know what you mean about being sad to put the Christmas stamps away for another year.... I just got a few very pretty ones, and I don't want to put them away yet, but.... There is always next year. Your Advent calendar has been A LOT of fun, and It was great reading other peoples responses. Thank you for all the holiday fun! Things are coming down close now, and soon the internet will be quiet.. I want to say Merry Christmas to you and your family before things get too busy to be able to say it. Beautiful creation once again. Wishing you a very merry christmas and much success for 2009! This is just gorgeous - Have a great Christmas.